This is a picture of the "golden popcorn" awarded at the 2012 MTV Movie Awards. The MTV Movie & TV Awards (formerly known as the MTV Movie Awards) is a film and television awards show presented annually on MTV. The nominees are decided by producers and executives at MTV. Winners are decided online by the general public. Presently voting is done through MTV's official website through a Movie & TV Awards voting website. The 2017 MTV Movie & TV Awards took place on May 7, 2017 and featured the first time men and women competing jointly in the acting categories. Winners are presented with the "golden popcorn" statue, made by New York firm, Society Awards. Unlike its sister event MTV Video Music Awards (which are broadcast live), the MTV Movie Awards (up to 2007) were taped and then broadcast a few days later. The entire production was taped in a completely different order than what the MTV viewing audience saw. For example, the show's host would tape all his/her monologues and introductions at one time, and all the musical acts would perform one after the other. Celebrities would often only appear at the live taping for the announcement of their award category, and members of the general audience fill-in their vacant seats during the other times. Through editing, MTV was able to present to its viewing audience an awards show which appears to be taped in live sequence, with celebrities remaining for the entire show. This method of production allowed profanity to be edited from the show and also is more convenient for the celebrities. The actual live taping aired same-day on pay-per-view channels in most metropolitan cities around the world. Some awards telecasts had also been shown in television syndication. However, in 2007, this changed, as MTV and Survivor producer Mark Burnett (who took over duties from Joel Gallen for the 2007 awards) announced that the 2007 edition would be broadcast live on MTV for the first time on June 3, 2007 in Los Angeles. The 2016 broadcast was the first show since 2006 not to air live as the event was taped on April 9, 2016 before airing on Viacom's MTV networks the following day on April 10. Since 2007, polls for several awards were voted by online users on MTV's official website. The Silver Bucket of Excellence is an award that was given to a film that has made lasting impact on moviegoers and the MTV audience. It was further defined in 2006 as honoring a "film of the past that resonates with even more meaning today." 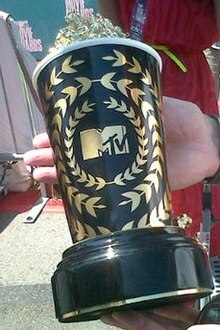 The MTV Generation Award is the successor to the MTV Lifetime Achievement Award, though it is more serious than its predecessor. The recipient of the award is celebrated for great achievement in movies. The distinction "is given to an artist who has shown us a variety of impressive roles, a personal and professional flair and of course, an awesome level of talent." The MTV Trailblazer Award recipient spearheads the way for others that work in the movie industry. The award is given to an actor of young age that managed to inspire others with a diverse portfolio of work and a transcendent reputation in the public eye. Since 1993, scenes are spoofed, mostly from that year's most popular films, although television shows and older movies have also been chosen. This may include sound and video montages, replacing some of the original cast with other actors (commonly, the hosts of each year's show) generally mocking the scenes of that film. The diversity of the spoofs can vary greatly, from one dialogue (such as in 2005) to several long scenes, including fighting and action sequences (2003). 2008 Iron Man, Kung Fu Panda and Tropic Thunder Robert Downey, Jr.
^ a b "MTV Movie Awards Expands To Include TV Series, Returns To Live Format, Gets Date". Deadline Hollywood. March 13, 2017. Retrieved March 13, 2017. ^ "2017 Movie & TV Awards - MTV Movie & TV Awards - MTV". MTV. ^ Palermo, Elizabeth. "Golden Globe Creator eyes the Prize All Year Long". www.businessnewsdaily.com. ^ Josef Adalian. "Burnett signs to MTV Movie Awards". Variety. ^ "Breaking News - '2006 MTV Movie Awards' to Honor Jim Carrey with Coveted 'MTV Generation Award' & Spike Lee's Epic 'Do the Right Thing' with 'Silver Bucket of Excellence' - TheFutonCritic.com". thefutoncritic.com. ^ "Jamie Foxx to receive the MTV Generation Award at the 2013 MTV Movie Awards". HitFix. ^ "Will Smith Is Bringing His Big Willie Style To The 2016 MTV Movie Awards". ^ Chip_douglas (July 1, 2007). "1992 MTV Movie Awards (1992)". IMDb. ^ "1993 MTV Movie Awards (1993)". IMDb. ^ "1994 MTV Movie Awards (1994)". IMDb. ^ Bradpittsbabe11 (May 28, 2002). "1995 MTV Movie Awards (1995)". IMDb. ^ "1996 MTV Movie Awards (1996)". IMDb. ^ amber_waves (February 27, 2001). "1997 MTV Movie Awards (1997)". IMDb. ^ Cinema Buff (August 31, 2001). "1998 MTV Movie Awards (1998)". IMDb. ^ Willow192 (April 3, 2001). "1999 MTV Movie Awards (1999)". IMDb. ^ Willow192 (April 3, 2001). "2000 MTV Movie Awards (2000)". IMDb. ^ "2001 MTV Movie Awards (2001)". IMDb. December 18, 2001. ^ anna (August 20, 2002). "2002 MTV Movie Awards (2002)". IMDb. ^ tahirjon6 (June 11, 2003). "2003 MTV Movie Awards (2003)". IMDb. ^ bsinc (June 23, 2004). "2004 MTV Movie Awards (2004)". IMDb. ^ kechupydeath (August 19, 2005). "2005 MTV Movie Awards (2005)". IMDb. ^ bob the moo (July 5, 2006). "2006 MTV Movie Awards (2006)". IMDb. ^ amblin53. "2007 MTV Movie Awards (2007)". IMDb. ^ Armagedd'NSync is not a traditional movie spoof, but rather a trailer parody created by an independent director Russell Bates. However, according to the creator's web-site Archived August 15, 2006, at the Wayback Machine (last retrieved on August 13, 2006), it has been featured at MTV Movie Awards 1998. This page was last edited on 17 April 2019, at 21:39 (UTC).